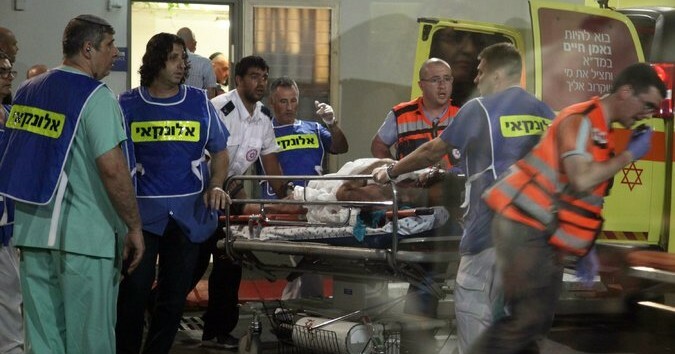 Four Israelis were killed and 16 wounded in an attack on a Tel Aviv market on Wednesday. Two Palestinians fired on people in the Sarona Market, near the headquarters of the Israeli Army and the Ministry of Defense. The gunmen, cousins Muhammad Ahmad Moussa Makhamreh and Khalid Muhammad Moussa Makhamreh, were detained and taken to hospital. One is in critical condition, while the other was moderately wounded. Israeli forces raided the hometown of the attackers, Yatta, near Hebron in the West Bank. They closed the entrances, and detained a number of people. The Defense Ministry said on Thursday that it is revoking 83,000 permits for Palestinians to travel to Israel during the holy month of Ramadan. The Palestinian movement Hamas said the attack was the first “good omen” for Palestinians and the first “surprise” for the “enemy” during the Muslim holy month of Ramadan, which began on Tuesday. Hamas spokesman Hussam Badran said the entry of the Makharems from the West Bank showed the failure of Israeli efforts seeking to eliminate the Palestinian resistance. Israel must realize the consequences of its persistence to push violence, house demolition policies, forced displacement of Palestinians, raids by Israeli settlers to the al-Aqsa Mosque compound, and the cold-blooded killing of Palestinians at checkpoints. The Popular Front for the Liberation of Palestine called the attacks a “paradigm shift” in the Intifada. It said the site of the shootings was a challenge the newly-appointed Defense Minister Avigdor Lieberman. Wednesday’s shootings were one of the highest-profile attacks since a wave of violence last autumn. More than two dozen Israelis and two American tourists were killed by Palestinian assailants, mainly in stabbing, while more than 200 Palestinians — some of them attackers, but others in raids by Israeli security forces — were slain.